1 bottle of Demon Max Insecticide Makes 40 gallons of spray mix. This insecticide has Low odor, and is very fast acting. See Demon Max label for detailed use instructions. Would you like to see the Demon Max MSDS sheet? 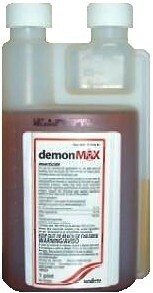 How about the Demon Max Label? Awesome product!! We use it to keep our MH free of any pests. Just follow the instructions and you be pest free! HIGHLY recommended!